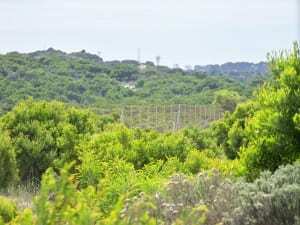 The trees at the Langa site consist primarily of the Port Jackson species. These trees are an alien species to South Africa imported from Australia. Port Jackson trees are favoured for use at the Langa site because they require little water, grow relatively fast, and provide proper screening and shade for initiates. The sandy soil at Langa does not deter this tree from growing freely. The Langa site has been given special permission from the City of Cape Town to allow these trees to remain on site, despite a policy requiring the removal of all invasive alien vegetation. 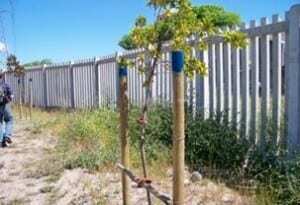 Of the trees planted on site, 105 Ficus natalensis (natal fig) were observed on-site that had been planted by the City of Cape Town around the concrete palisade fence enclosing the site. These trees were chosen for their ability to grow in sandy soils. However, they can require an irrigation system for up to three to four years. At one year old, these trees are not currently able to screen the site or provide much additional seclusion for the initiates. Trees were planted 2 meters from the fence and ten meters apart, as recommended by the City Parks Department. The team recommends that a hedge be planted at the Langa Initiation Site between the existing Ficus natalensis trees to help provide additional screening while the trees continue to grow. On site, initiates are forbidden to cut down any vegetation. They are required to provide their own material for the construction of their hut. Recently, the management team has found that vandals have cut down some trees on site for firewood. In order to preserve the land and vegetation, the site has been divided into two sections. Each section is used semi-annually. This site rotation allows for vegetation growth and helps preserve a more forest-like appearance. Grasses cover much of the site.